﻿ Nélson Oliveira: "Cristiano Ronaldo is my main reference in football"
29.08.2011 » Nélson Oliveira: "Cristiano Ronaldo is my main reference in football"
The new Portuguese sensation, Nélson Oliveira, plays for Benfica and recently won the award for the second best player in the FIFA U-20 World Cup, where Portugal has only lost in the final against Brazil. The Portuguese striker looks at Cristiano Ronaldo as his main reference in football. 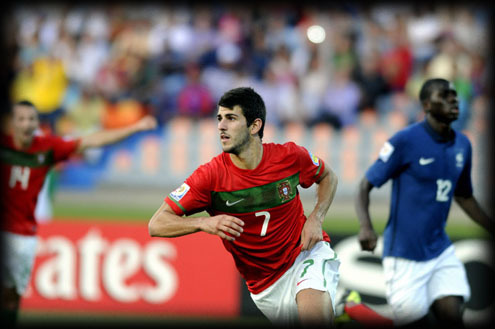 Nélson Oliveira: "There are still so many things things I have to learn before becoming a mature football player. I'm just a 20 years old boy. I have a lot to learn and develop. My opinion is that every player is maturing until they turn 24 and only then we become more grown-up and stable. Therefore, I usually say I'm just a boy who is learning and who wants to become a football player." Cristiano Ronaldo for example, moved from Sporting C.P. to Manchester United with only 18 years old and there are valid arguments noting that CR7 keeps maturing over the last couple of years since he joined Real Madrid, even though the Portuguese superstar is 26 years old. We will also take this opportunity to invite our readers to read about Real Madrid news on a very good and informative news portal	about the Merengues: managingmadrid.com. Nélson Oliveira: "My main reference in football is Cristiano Ronaldo, because besides being a great football player, he also has a tremendous predisposition to work and train hard. In my opinion, Cristiano Ronaldo is the best player in the World." noted the young Portuguese player. He then added: "But there's still another player who plays in the same position as I do and who I appreciate a lot, Zlatan Ibrahimovic." Before ending the interview,	Nélson Oliveira still talked about the sacrifices a young boy has to make if he wants to become a professional football player: "I had to give away a few things, that boys at my age usually like to do. But football players are lucky because they are granted the chance to do do what they love doing. There are a lot of people out there who can't say the same. Most of the times, football players have to say "no" when friends go out, and regarding that, we have to set our own specific rules. We can't have a normal night life as our friends and we have to go out at night less times than them." Some good advices for all those young kids who still have the dream of becoming a professional football player like Cristiano Ronaldo. Real Madrid next game in La Liga will take place only in the 10th or 11th of September against Getafe, due to National Teams commitments this week. Cristiano Ronaldo will join his Portuguese team mates in the next days, in order to prepare the match against Cyprus, on Friday. You can watch Juventus live stream, Portugal vs Cyprus live streams this Friday (02-09-2011) and Cristiano Ronaldo playing, inside our Live Games Streams section.